Millcreek Herbs LLC - Herb Articles - Healthcare: Adaptogens - Dedicated to the understanding, wise use and enjoyment of herbs. Merry's articles and herbs research will help you to learn more about medicinal herbs, culinary herbs and the wellness benefits of Complimentary Alternative Medicine (CAM). I work full time as a teacher, parent twin toddlers and my elderly father has just moved in with us. I drink a lot of coffee, but I feel tired all the time. I am concerned that I might be more susceptible to getting sick. Do you have any herbs that can give me more energy and keep me healthy? It is understandable you feel tired. With all the stress and demands of your life, you are tired. Prolonged stress can take a toll on health. We were made to handle extreme stress only on the short term (just long enough to escape an immediate threat), not chronic, ongoing stress that lasts years. Coffee ramps up the nervous system which depletes energy even further. And when energy reserves are spent, we seem more susceptible to illness. A category of herbs called "adaptogens" may be helpful. Usually we think to get more energy we need to stimulate our bodies with caffeine or ephedra, but adaptogens actually minimize the sympathetic stress response in the body. The sympathetic system initiates the body's innate, uncontrollable, physical response to stress. Everyone does stress differently. Some people eat more, some less. Some want to sleep all the time and others can't hold still. Whatever your personal responses to stress, adaptogens can be useful to quiet them, allowing you to feel more energetic. Some of the most frequently used adaptogens are the ginsengs (Panax spp.). There are several species, and to confuse matters, some are cured, which changes how they affect our bodies. To simplify things, let's consider only Chinese (Panax ginseng) and American ginseng (Panax quinquefolium). Many preparations are available, but as always with herbs, good quality is most important. Because it takes years to grow and is in high demand, ginseng is one of the most expensive herbs on the market, making it, unfortunately, one of the most adulterated. This plant has a fascinating history. In China, where it has been revered for thousands of years, only men were allowed to use it. Also, early European settlers in America had a thriving trade in American ginseng, which they harvested from the hardwood forests and shipped to China. The herb apparently helped with the libido, among its other properties. Years ago when I was on a layover in the T'aipei airport, I saw beautiful, red velvet lined boxes holding single, large, anthropomorphic, ginseng roots that owners displayed in their homes or gave as gifts. The price on some was $500! 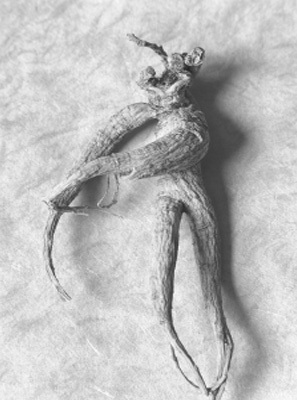 The more humanoid features the root has, the more desirable it is, especially if there is a resemblance of genitalia. Another adaptogen I like is Eleutherococcus, formerly known as Siberian ginseng. The Latin name reveals that this plant is not truly a ginseng. However, this root from Russia acts similarly to the ginsengs, supporting proper function of the adrenal glands, which can be adversely affected by long-term stress. Eleutherococcus is being overharvested, but it is still very affordable. One of the beauties of ginseng is that by preventing your body from running itself into the ground, it allows you to stay healthier. James Green explains in his wonderful book, The Male Herbal, "This adaptogen action appears to work through hormonal regulation of the stress response, which in turn has a modulating effect on human immunity." When you use ginseng, you may find your outlook on life is brighter and you feel you have more energy for daily living. Be warned though, this sense of well-being may help shift you into new directions or give you the ease to look squarely at something that you have wanted to avoid.